The number of homeless people sleeping rough in London has rocketed by 64% since 2010, according to a damning new report. The report by the London Assembly Housing Committee (LAHC), ‘No Going Back‘, (pdf) reveals that around 6,500 people were seen sleeping rough in London during 2013/14 – an increase of 64% since the tory-led coalition government took office in 2010. It’s 20 June, 2013. A 38-year-old man, distressed, emaciated, depleted from chemotherapy, dishevelled from sleeping rough, walks out of Islington council offices on Upper Street, north London, and pulls out a syringe. It contains two grams of crystal methamphetamine – enough to kill him. He finds a vein and slides the needle in. Moments later, pool attendants from the nearby leisure centre see the man collapse on the street. They rush out, and, in the half-breath between life and nothing, reach him, resuscitate him, and phone for help. Yesterday, I went to the home of a Kilburn man who is 51, has mild learning difficulties and currently signs on. He has worked all his life in hotels and in kitchenwork, but found it harder to get and keep work during the recession. He’s been out of work for four years now and is depressed about it. He doesn’t read or write very well and thinks that is the reason he’s finding it difficult to get another job. More on that soon. For now, he wanted to show me his flat. It’s the tiny, single room in Kilburn you see here – so small that it was difficult for the four of us who were there to fit into all at once. His rent is paid in housing benefit – which means that his landlord gets housing benefit for renting this tiny little room out as a flat. There was a bed, a broken fridge, another fridge in the middle of the room that this man had bought to keep his diabetes medication in, because it must be kept cool, and a broken oven. He’d got a second smaller oven with two hotplates to sit on top of the broken oven so that he’d at least have hotplates that worked. You can see that in the video. This man has complained to his landlord about the mice and cockroaches that live under the broken oven, but nothing has been done. There are no windows in this “flat” – just a door that leads to a shared path down the side of the house. In the heat, the room has been nearly uninhabitable. To cap things off, he says he has to do a jobsearch of about seven to ten jobs a week and has been threatened with sanctions if he doesn’t. He has been sent on the work programme. He wants another job. I’ll add to this story and have a lot more video to post, but – have this to think on for now. Here we are in 2014. Austerity’s over, you know. For some. [Picture: I Am Incorrigible blog – http://imincorrigible.wordpress.com/2013/09/15/evidence-not-ideology-benefit-tourism-the-problem-only-fruitloops-and-tories-can-see/ – which agrees that benefit tourism is a non issue and distraction from the UK’s real problems.] The UK is to cut the amount of time EU migrants without realistic job prospects can claim benefits from six to three months, according to David Cameron – who seems desperate to take attention away from Andy Burnham’s speech today on the Coalition’s unwanted privatisation of the National Health Service. In collecting evidence for his review of the failings of the benefits sanctions process, welfare expert Matthew Oakley could have spoken to me. Since 2011, I’ve been sanctioned many times. I received a long benefits sanction due to a mix-up about Work Programme courses I should have attended as a condition of receiving out-of-work benefits. Life became hell. Once my food had run out, I had no money to buy more. I was sent back on the Work Programme but without funds to feed myself. The hunger was unbearable. I did not have the energy to turn up. This led to another sanction. The sanctions became a vicious cycle as I became too ill to do anything. When I did get a job interview, I looked like a zombie as I had lost so much weight. I could not focus properly and lacked energy. Support from friends and family fell away as they assumed I was addicted to drugs. I was just hungry. I tried contacting my local MP but he did not seem interested. I felt alone and trapped. With nobody to turn to, and feeling like it was my only option, I pocketed a sandwich from a supermarket. I was arrested and fined £80. I had no way of paying and spent a week in prison for non payment. I lost my flat as I was £1,000 in rent arrears and I had piles of outstanding bills. After a year without benefits, I approached a local homeless shelter for help. They took me in and fed me until the sanction was over. It was only in the hostel that I discovered that I was entitled to hardship payments, of which the Jobcentre had failed to inform me. I now volunteer at the homeless shelter as a thank you for all their help and because it feels good to help feed hungry people. I’ve tried my hardest to avoid more sanctions, but I’ve since been sanctioned for missing my signing in appointment, because I was at a job interview, of all things. And I’m not alone. A research programme I’m involved in at Leeds University has heard from other people, such as Chloe, who was sanctioned for not doing enough to find work. “Four to eight weeks with no money is pretty alarming when you’ve got kids and bills and a house to run. I think I’ve cried solid for two weeks. I can’t cope,” she told researchers. As Rosie, another single mother from the study put it: “They’re all right saying that you’re sanctioned as a punishment for not going in [for an appointment] but what am I and my son meant to eat? If that’s the only money we’re getting, what are we meant to do?” I thought “sanctions” were for criminal countries who pose a threat to the world. But now I know they are used against ordinary citizens too. The government doesn’t trust the cumulative impact study an independent charity has carried out on it’s welfare ‘reforms’. Here is the cumulative impact that the Conservative’s welfare reforms are having on one mentally ill army veteran diagnosed with cancer. An army veteran I know who was homeless didn’t have a bank account or post office account or proof of identity. He suffers from Post Traumatic Stress Disorder dating back to the Iraq war, and has been unable to work for years. They said he had to start using a Payment Card to get his benefits rather than collecting them in cash. But none of the official Paypoints would accept the card without proof of identity. He had to apply for a passport and to do that he needed his birth certificate, and both cost money. Meanwhile he wasn’t receiving a penny in benefits, and it was a cold winter (2012 – 13), he was developing cancer, since diagnosed, and didn’t even have the money to pay for an overnight bed in a hostel. He was on the streets, in pain and begging, and borrowing money where he could. So firstly he had to raise over £100 to apply for birth certificate and passport. The money was eventually found, an application sent off for the birth certificate. It arrived a couple of weeks later. Off went the application for his passport. It took 5 weeks (no money to pay for a fast track service). He went to the paypoint with his Benefits Payment card and new passport. Instead of many weeks accumulated back pay, there was no money in the account. Several phone calls later (with no money, remember) he found that as the money had been sitting in the account for over 6 weeks, the DWP had clawed it back. Months and months later, still no backpayment, and he has been unable to pay back the people who lent him money. At this point he was diagnosed with aggressive colon cancer, which has since spread. He is now housed in a pokey private let ‘studio’ although he can’t afford heating because of a rampant pre-pay meter, plus having to pay a proportion of his council tax and rent. He is now receiving treatment for his cancer, but still being put through the mill by Atos and co, who have turned down his ESA claim and are forcing him through the appeals process for both his sickness benefit and his Army pension. He has been summoned to four Atos assessments in under a year. He has been offered a place in an Army hospice which he really likes and needs, but it is over 100 miles away from his flat and hospital treatment. If he moves to the hospice and transfers his treatment to a local hospital near there, he will lose his flat. And as he will only get out of the hospice if he is better, he will no longer be considered an urgent case by the local council, and will stand no chance of social housing. Or any housing at all in this part of London, because of the benefit cap. He will be back on the streets. Relying on local contacts to survive his precarious life, if he moved out of the area he would be lost. An army charity has finally provided some funds to take him back and forth from the hospice to his treatment, which involves staying in London a couple of days each week. The London hospital would not provide patient transport from his flat to the hospital because he could walk and did not currently have a terminal diagnosos. He has had to shuffle 4 miles each way to and from the hospital to get his chemotherapy and other treatment. The bowel cancer makes walking very painful, and after chemotherapy a patient is supposed to rest. The bowel cancer has now spread to his bladder. I have tried to help him over the last year and a half, and he has given me permission to tell his story. The coalition will leave more debt than all Labour governments since 1900. The current government is now responsible for £517 billion of the trillion-plus-pound UK public debt, compared to £472 billion accrued during the 33 years Labour led the country since the turn of the twentieth century. And the figures look even worse when you adjust for inflation. When you do that, the Coalition’s share jumps to nearly half of the total debt. 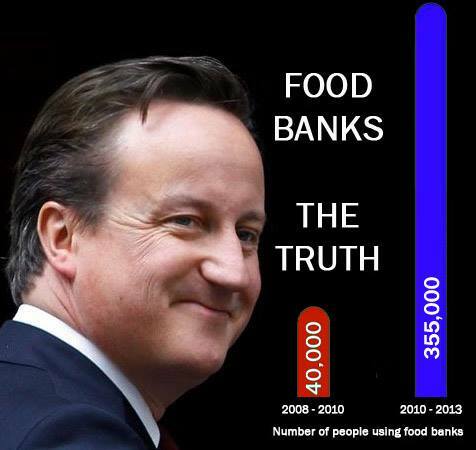 But the Coalition don’t meet any public’s needs, they simply serve the wants of a powerful, wealthy elite. Labour invested in public services, the Tories have bled them dry. So, what have they done with the money? Because the public have seen only austerity cuts. And the most vulnerable bear the brunt of the cuts.